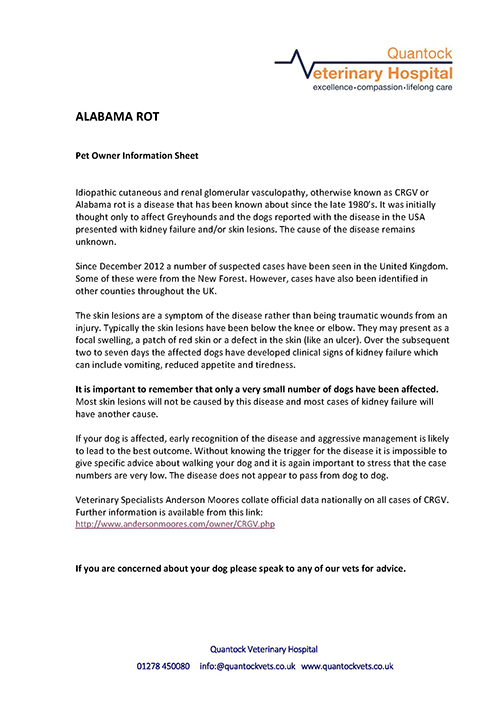 You may have recently seen some rather alarming articles in the press about Alabama Rot – a condition officially known as CRGV which affects dogs. CRGV is a disease caused by damage to the blood vessels of the skin and kidney. Its cause is unknown. CRGV causes skin lesions that can look very similar to cuts, wounds, stings or bites. In the worst cases skin ulceration can lead to kidney failure and death. HOWEVER, although Alabama Rot is a very serious condition, the number of dogs affected with it remains very low. Most of the time a skin problem will not be caused by CRGV. If you spot any unexplained redness, sores or swelling of the skin, particularly on a dog’s paws or legs but also the body, face, tongue or mouth do seek veterinary advice if you’re at all worried. But once again, PLEASE DON’T WORRY too much, we see many dogs with skin lesions of all types every week and we have never had a case of Alabama Rot. Veterinary Specialists, Anderson Moores collate data on all cases nationally. Further information is available here.